Your Dogs in Freezing Weather — know the rules. 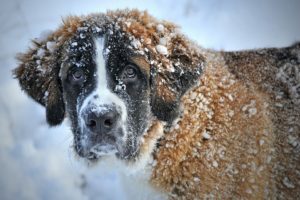 The dogs that are low to the ground and getting cold and getting salt on them, makes it worse too.” As Bertrand explains, cold weather may also worsen some medical conditions in dogs, such as arthritis. “We especially find it happens when it is damp and cold, but the cold for sure. Dr. Hailey Bertrand, a veterinarian at Parkside Animal Hospital in North Bay, points out every dog is different when it comes to how well it tolerates the cold. “Most of the time, if they have a lot of long fur, and different breeds determine how much body fat they have and in what places, like your huskies, your malamutes, your northern breeds, they tolerate cold better because of their fat distribution, and fur and skin. A lot of them have very thick skin,” explained Bertrand. As Bertrand explains, cold weather may also worsen some medical conditions in dogs, such as arthritis. “We especially find it happens when it is damp and cold, but the cold for sure. A lot of times they are not as active, and they’re sleeping more because it is cold and they can’t go outside. It causes stiffening in their joints, they’re not as loose, they’re not as mobile. The cold causes everybody to tense up and that isn’t helpful for arthritis,” said Bertrand. Pet owners are advised to watch for signs of hypothermia, and any signals your dog might give off, showing it is uncomfortable in the cold. Paws should also be checked for signs of frostbite. Dogs may find themselves walking in road salt, or even picking up some anti-freeze on their paws or fur. Bertrand advises wiping down your pet when it gets back into the house, so it doesn’t lick some of these toxic chemicals. And that grinch fur growing between their toes can become a source of irritation due to a build up of ice and snow. When it comes to dressing dogs for the elements, Bertrand says if the animal tolerates wearing something on its feet or torso, go for it.